Germany’s head coach, Joachim Loew, watches his players during a recent training session in Porto Alegre, Brazil. Africa’s last two hopes take the field Monday, but neither of them have much of a shot. Can one (or both) of them shock a European power? Despite losing its final match of the group phase to Argentina (yielding a pair of goals to the incomparable Lionel Messi), Nigeria was still able to qualify for the World Cup’s knockout round by way of an Iranian defeat against Bosnia-Herzegovina. Now it has to face France, which ranks as the world’s fifth-best national team in ESPN’s Soccer Power Index (SPI). Do the Super Eagles have a chance? Our current projections give Nigeria only a 24 percent probability of toppling a tough French side that’s as balanced as it is talented (France ranks sixth in SPI offense and fifth in defense). Nigeria will need to keep particular tabs on Karim Benzema, France’s all-universe forward. In the tournament’s round-robin phase, he terrorized Group E with three goals and two assists, and has been one of the best players of the World Cup thus far. He was a big reason why France scored eight total goals in its first two group-stage matches (before being held scoreless by Ecuador in a match France didn’t really need in order to win the group). Nigeria’s best hope to shut down France lies in its defense. Before Messi menaced the Super Eagles in the group-stage finale, they had kept clean sheets in each of their first two matches. According to the metric of individual contribution I computed here, five of Nigeria’s six most instrumental performers during the group stage were defensive-minded players — goalkeeper Vincent Enyeama, defenders Kenneth Omeruo and Efe Ambrose, and holding midfielders John Obi Mikel and Ogenyi Onazi. Life won’t be easy for them Monday (our model says there’s a 56 percent chance France scores at least two goals during regulation time), but it will be tough for Nigeria to prevail unless they keep France’s offense in check. In the other matchup of the day, Germany faces Algeria in what looks to be one of the Round of 16’s most lopsided affairs. I wrote about the Germans at length when they faced the United States last Thursday, so I won’t belabor the point. They’re one of the best sides in the world, incredibly dangerous offensively and composed almost entirely of players in their soccer primes. It’s going to be a tall order for the Algerians to stop them, especially since Algeria has (by far) the worst defense of any team to advance to the knockout round, according to ESPN’s Soccer Power Index (SPI) numbers. Algerian attacking midfielder Sofiane Feghouli enjoyed a good start to the tournament, racking up a goal and an assist in his first two group-stage appearances, but the pressure will be on him to perform against Germany as one of the few Algerian players of world-class quality. Then again, Algeria’s defense is so porous (and Germany’s offense so potent), that it may not matter. 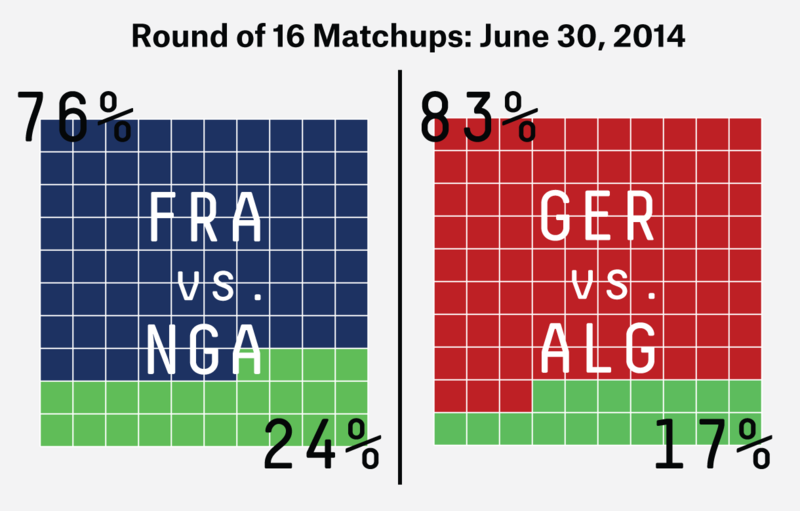 With just an 17 percent probability of victory according to the FiveThirtyEight model, it would be the upset of the tournament thus far if Algeria somehow manages to topple the German juggernaut. For 87 minutes, Mexico looked ready for el quinto partido. It took just seven minutes for crushing defeat to set in. Wesley Sneijder’s goal in the 88th minute and a penalty kick by Klaas-Jan Huntelaar in the fourth minute of added time brought Mexico’s tournament to an abrupt end. In the first half, El Tri matched the Netherlands touch-for-touch in possessions in the attacking third (50-46 in favor of the Dutch). The Mexicans held the Dutch to one chance created and one shot on goal, both tournament lows for the Oranje. But the Netherlands exploited a Mexican weakness to score the latest equalizer in Dutch World Cup history. Mexico leaves the tournament having allowed opponents eight chances created off set pieces, tied with South Korea and Uruguay for most of any country. Holland’s first goal came off a corner kick, as Huntelaar’s back-post run left him open to head the cross back to the center of the box. As Sneijder struck the ball just inside the penalty area, the closest Mexican defender in front of him was just outside the 6-yard box. That was more than enough room for Sneijder. Miguel Herrera, whose team had been in almost constant attack throughout the tournament, became conservative over the last 90 minutes. Before the 61st minute (when Dos Santos subbed off), the Dutch had a 75-62 lead in attacking-third touches, a respectable margin for Mexico against the Oranje. But after Dos Santos left for midfielder Javier Aquino, the Dutch had a 63-30 advantage in attacking-third touches.